I hate change. There. I said it. But I am officially a convert. I’ve always been a MAC girl, but a few months ago I had the pleasure of meeting a makeup artist from Makeup For Ever at Sephora at the Rideau Centre. I was given a 101 on the right make up for my skin tone, colours that would make me glow, and of course a few goodies. I’ve now been wearing the Primer and Foundation every day and I LOVE the coverage. Light, non-greasy and stays on all day. I can’t believe it but I don’t think I could go back to my original MAC Studio Fix. The Metal Collection offers a high coverage with a chrome shine. Have you changed something (for better or worse) in your makeup bag? Well I don´t have a make up bag haha...though I have a skin care one xD....anyways this look amazing..I love the one in the middle looks like a beautiful color. It's not sticky! I must give this a try. Sticky is the worst. I love Make Up For Ever products. They go on so smoothly. I never heard of this line. 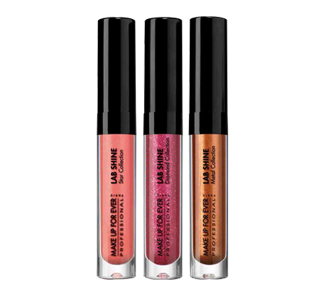 I am always looking for a great lip gloss. I am going to try this line out.